Residential Plot at Santhi Nagar, Kavali Municipality, SPSR Nellore Dist. Lot details : Property No.2) Residential House Plot 9 & 10 Near D No.10-15-48, Sy No.1985, 10th Ward, Santhi Nagar, Kavali Municipality, SPSR Nellore Dist, Measuring area of 781.11 Sq.Yds in the Name of Sri Medarametla Venkata Krsihna Reddy. Schedule of Property : Property No.2) Residential House Plot 9 & 10 Near D No.10-15-48, Sy No.1985, 10th Ward, Santhi Nagar, Kavali Municipality, SPSR Nellore Dist, Measuring area of 781.11 Sq.Yds in the Name of Sri Medarametla Venkata Krsihna Reddy. Boundaries : East : Road, West : Plot No.4 & 5, North : Plot No.8, South : Site of K Padmaja. 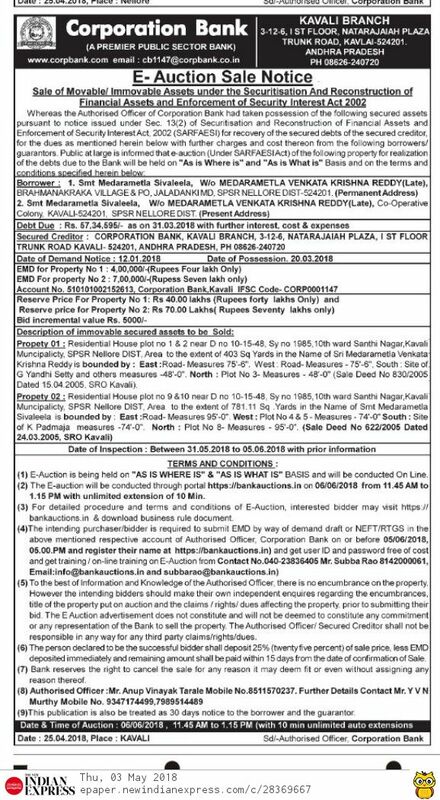 Sale Deed No.622/2005 Dated 24.03.2005.SRO Kavali.